Preheat oven to 450° F. Lightly coat a 9 x 9 x 2-inch baking pan with nonstick cooking spray; set aside. Thaw fish, if frozen. Rinse fish; pat dry with paper towels. Cut fish into two serving-size pieces, if necessary. Measure thickness of fish. Place flour in a shallow dish or small bowl. In another shallow dish, whisk together egg white and milk. In a third shallow dish, combine bread crumbs, almonds, and thyme. Coat both sides of fillets with flour. Dip fillets in the egg mixture; dip in bread crumb mixture to coat. Place fish in prepared pan. Drizzle fish with oil. Bake until fish begins to flake when tested with a fork (allow 4 to 6 minutes per 1/2-inch thickness of fish). 75% less sat fat • 76% less sodium than the original recipe. 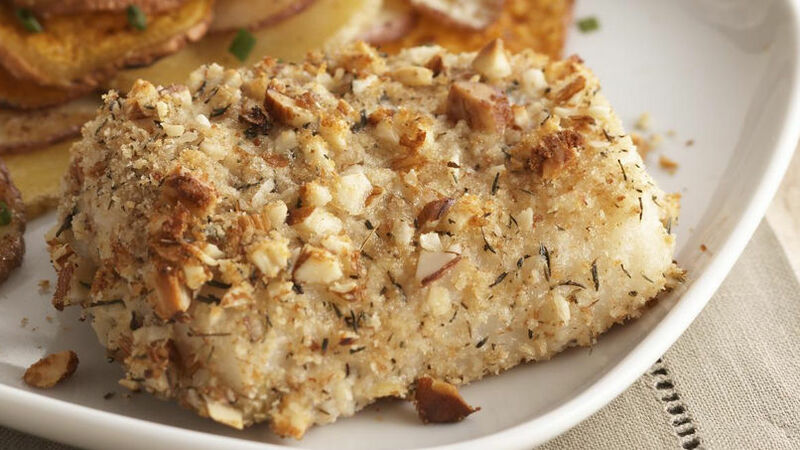 Mild white cod dresses up deliciously with a coat of herbed crumb-and-nut coating.